Lacto-ovo vegetarians are people who do not eat meat, but do include dairy products (lacto) and eggs (ovo) in their diets. The term vegetarian was coined in 1847 by the founders of the Vegetarian Society of Great Britain, although vegetarianism as a way of life has existed for thousands of years. The founders of the Vegetarian Society were lacto-ovo vegetarians. One of the central ideas that has motivated vegetarians is that food choices should not require the death or suffering of animals. Thus, many vegetarians avoid meat but eat dairy products and eggs (on the grounds that store-bought eggs are unfertilized). Some people argue, however, that eating eggs may prevent the life of an animal, so some vegetarians are lacto-vegetarians. Veganism, another type of vegetarianism, follows a diet that uses no animal products at all. Some of the world’s oldest religious traditions have advocated vegetarianism as a means to both physical and spiritual health. In the Christian tradition, the Trappist monks of the Roman Catholic Church are vegetarian, as are the Seventh Day Adventists, who form a group large enough that many studies have been performed on them to determine the health benefits of lacto-ovo vegetarianism. Some vegetarians maintain that there is evidence that Jesus and the early Christians were vegetarians as well. In ancient India, the idea of ahimsa developed, which means “not doing harm.” Followers of this creed believe that living in a manner that reduces the suffering of other living beings, including animals, is necessary to reach higher levels of spiritual health. In the Hindu religion, cows are considered sacred animals because Hindus believe that milk is a nutritious and life-supporting gift from nature. Millions of Hindus are lacto-vegetarians. The yoga system of living and health is vegetarian, because its dietary practices are based on the belief that healthy food contains prana. Prana is the universal life energy, which yoga experts believe is abundant in fresh fruits, grains, nuts and vegetables, but absent in meat because it comes from an animal that has been killed. Some Buddhists in Japan and China are vegetarian because of their spiritual beliefs. 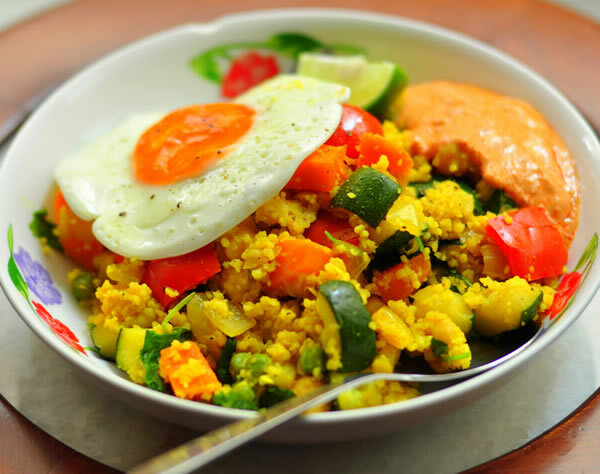 Other traditional cultures, such as those in the Middle East and the Mediterranean regions, have evolved diets that consist mainly of lacto-ovo vegetarian foods. The Mediterranean diet, which a Harvard study declared to be one of the world’s healthiest, is primarily although not strictly lacto-ovo vegetarian. The list of famous vegetarians forms an illustrious group. The ancient Greek philosophers, including Socrates, Plato, and Pythagoras, advocated vegetarianism. Other famous vegetarians include Leonardo da Vinci, Sir Isaac Newton, the physician Albert Schweitzer, writer George Bernard Shaw, musician Paul McCartney, and champion triathlete Dave Scott. Albert Einstein, although not a strict vegetarian himself, stated that a vegetarian diet would be an evolutionary step forward for the human race. Vegetarianism in America has generally consisted of a small but vocal number of adherents. It has its roots in the mid-1800s, when some people began to question accepted health and dietary practices. In 1839, Sylvester Graham, who invented the “graham cracker” from whole wheat flour, wrote Lectures on the Science of Human Life. A few decades later, Ralph Waldo Emerson and Henry David Thoreau both advocated vegetarianism. In 1883, Howard Williams published The Ethics of Diet, which promoted vegetarianism and listed all the famous vegetarians throughout history. Williams’s book influenced many people around the world, including Russian writer Leo Tolstoy and Indian political leader Mahatma Gandhi, although vegetarianism remained largely unpopular in America. In the twentieth century, vegetarianism steadily gained followers in America, although it met considerable resistance from the meat industry and general public. By the 1960s, the consumption of meat in America had increased significantly from consumption levels at the turn of the century. Meat and dairy foods made up two of the four recommended food groups designed by the United States government. Some researchers claimed that meat was fundamental to health, while a growing minority of nutritionists began to correlate the meat-centered American diet with rising rates of heart disease, cancer, and diabetes. In 1971, Frances Moore Lappe published her landmark book, Diet for a Small Planet. Up to that time it was believed by American nutritionists that only meat could supply adequate protein. Lappe argued that by combining particular foods such as rice and beans, which was done in the diets of older cultures, vegetarians could obtain proteins that are as complete as protein derived from meat. The book sold millions of copies, and researchers have since confirmed that vegetarianism provides adequate amounts of dietary protein. Lappe’s book also argued that meat-centered diets are unhealthful for both people and the environment, and converted many to its ideas. In 1987, John Robbins published Diet for a New America, in which he makes a strong point against the health issues of a meat-centered diet, and against the cruelty inflicted on animals from modern factory farming. Vegetarianism has been steadily gaining acceptance as an alternative to the meat-and-potatoes bias of the traditional American diet. In 1992, Vegetarian Times magazine took a poll that showed that 13 million Americans, or 5% of the population, identified themselves as vegetarians. Several factors have contributed to the interest in vegetarianism in America. Outbreaks of food poisoning from meat products, as well as increased concern over such additives in meat as hormones and antibiotics, have led some people and professionals to question the safety of meat products. There is also an increased awareness of the questionable treatment of farm animals in factory farming. The environmental impact of an agricultural system based on meat production has also been examined more closely. Some argue that the raising of livestock has been shown to cause soil erosion, water contamination and shortages, pollution, deforestation, and inefficient use of natural resources. The growing health consciousness of Americans is probably the most important reason for the surge of interest in vegetarianism. Nutrition experts have built up convincing evidence that there are major problems with the conventional American diet, which is centered around meat products that are high in cholesterol and saturated fat, while low in fiber. Heart disease, cancer and diabetes, which cause 68% of all deaths in America, are all believed to be influenced by diet. Nutritionists have repeatedly shown in studies that a healthy diet consists of plenty of fresh vegetables and fruits, complex carbohydrates such as whole grains, and foods that are high in fiber and low in cholesterol and saturated fat. Vegetarianism is a diet that fulfills all these criteria. In alternative medicine, vegetarianism is a cornerstone dietary therapy, used in Ayurvedic treatment, detoxification therapies, the Ornish and Wigmore diets, and in treatments for many chronic conditions including heart disease and cancer. Lacto-ovo vegetarianism is sometimes recommended as a dietary therapy for a variety of conditions, including heart disease, cancer, diabetes, stroke, high cholesterol, obesity, osteoporosis, hypertension, gout, gallstones, kidney stones, ulcers, colitis, hemorrhoids, premenstrual syndrome, anxiety, and depression. A 2001 study showed that vegetarian diets often contain more copper than nonvegetarian diets. Copper is an important nutrient often lacking in today’s typical diets. Lacto-ovo vegetarianism is an economical and easily implemented preventive practice. It does, however, require self-education regarding an adequate diet in those who adopt it. 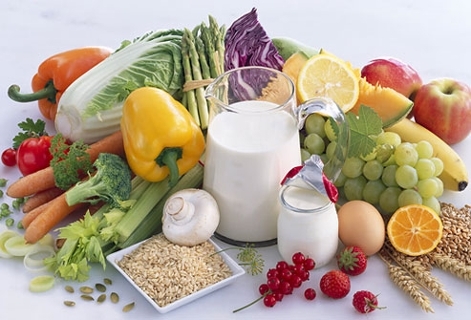 It is generally recommended that a vegetarian diet be adopted gradually, to allow people’s bodies and lifestyles time to adjust to new eating habits and food intake. Some nutritionists have designed “transition” diets to help people become vegetarian in stages. Many Americans eat meat products at nearly every meal, and the first stage of a transition diet is to replace meat in just a few meals a week with wholly vegetarian foods. Then, particular meat products can be slowly reduced and eliminated from the diet and replaced with vegetarian foods. Red meat can be reduced and then eliminated, followed by pork, poultry and fish. Individuals should be willing to experiment with transition diets, and should have patience when learning how to combine vegetarianism with such social activities as dining out. Many vegetarian cookbooks are available to help new vegetarians prepare meals at home. The transition to vegetarianism can be smoother for those who make informed choices regarding dietary practices. 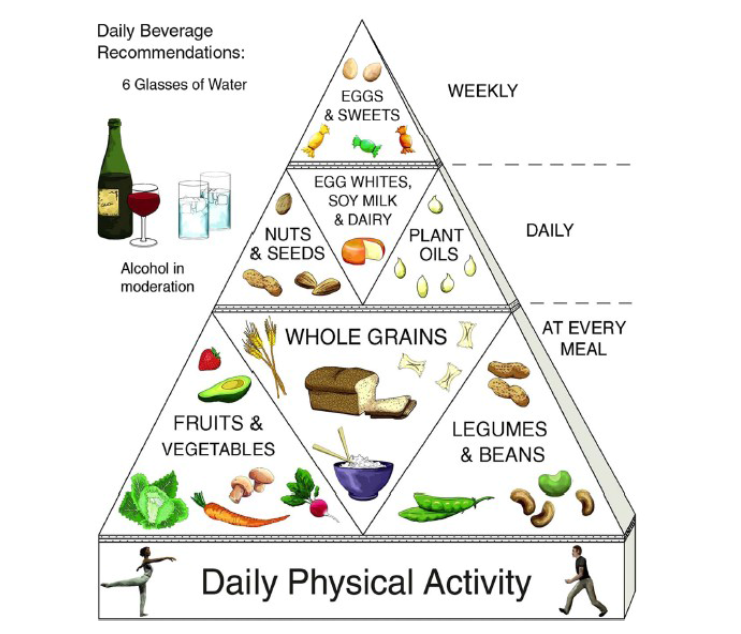 Sound nutritional guidelines include decreasing fat intake, increasing fiber, and emphasizing fresh fruits, vegetables, legumes, and whole grains while avoiding processed foods and sugar. Other helpful health practices include reading food labels and understanding such basic nutritional concepts as daily requirements for calories, protein, fats, and nutrients. Would-be vegetarians can experiment with meat substitutes, foods that are high in protein and essential nutrients. Many meat substitutes are now readily available, such as tofu and tempeh, which are soybean products that are high in protein, calcium and other nutrients. There are “veggie-burgers” that can be grilled like hamburgers, and vegetarian substitutes for turkey and sausage with surprisingly realistic textures and tastes. Adopting a lacto-ovo vegetarian diet does not automatically mean an improvement in health. One of the advantages of lacto-ovo vegetarianism is that eggs and dairy products are good sources of the protein, vitamins, and minerals for which vegetarians may have special requirements. Both eggs and dairy products, however, are generally high in calories and fat, and contain cholesterol and saturated fat. Studies have shown that some vegetarians consume higher than recommended quantities of fat, and some vegetarians have high cholesterol levels. The lacto-ovo vegetarian diet is most healthful when it uses eggs and low-fat dairy products sparingly to supplement a diet rich in whole grains, fruits, vegetables, and legumes. Another option for lactovegetarians is to use only egg whites (which contain no fat) and nonfat dairy products if high cholesterol and fat consumption are problems. Vegetable sources of saturated fat include avocados, nuts, and some cooking oils. In general, a well-planned lacto-ovo vegetarian diet is healthful and safe, and contains all the nutrients needed by the body. Vegetarians who eat few animal products, however, should be aware of particular nutrients that may be lacking in non-animal diets. These are protein, vitamin A, vitamin B12, vitamin D, calcium, iron, zinc, and essential fatty acids. Furthermore, pregnant women, growing children, and people with certain health conditions have higher requirements for these nutrients. Vegetarians should be aware of getting complete proteins in their diets. A complete protein contains all of the essential amino acids, which are proteins that are essential to the diet because the body cannot make them. Meat and dairy products generally contain complete proteins, but most vegetarian foods such as grains and legumes contain incomplete proteins, lacking one or more of the essential amino acids. Vegetarians can overcome this difficulty by combining particular foods in order to create complete proteins. In general, combining legumes such as soy, lentils, beans, and peas with grains like rice, wheat or oats forms complete proteins. Eating dairy products or nuts with grains also makes complete proteins. Oatmeal with milk on it is complete, as is peanut butter on whole wheat bread. Proteins do not necessarily need to be combined in the same meal, but generally they should be combined over a period of a few days. Getting enough vitamin B12 may be an issue for some vegetarians, although this vitamin is present in both eggs and dairy products. Vitamin supplements that contain vitamin B12 are recommended, as are fortified soy products and nutritional yeast. Research has indicated that vitamin B12 deficiency is a risk for vegetarians, especially vegans. Those choosing a vegetarian diet should watch carefully to ensure they get enough active vitamin B12 from diet and supplements. Deficiency of this vitamin poses particular risk to pregnant women and nursing mothers. Vitamin D can be obtained in dairy products, egg yolks, fortified foods, and sunshine. Calcium can be obtained in dairy products, enriched tofu, seeds, nuts, legumes, dairy products, and dark green vegetables including broccoli, kale, spinach, and collard greens. Iron is found in raisins, figs, legumes, tofu, whole grains (particularly whole wheat), potatoes, and dark green leafy vegetables. Iron is absorbed more efficiently by the body when iron-containing foods are eaten with foods that contain vitamin C, such as fruits, tomatoes, and green vegetables. Zinc is abundant in eggs, nuts, pumpkin seeds, legumes, whole grains, and tofu. For vegetarians who eat no fish, getting enough omega-3 essential fatty acids may be an issue, and such supplements as flaxseed oil should be considered as well as eating walnuts and canola oil. Vegetarians may also consider buying organic foods, which are grown without the use of synthetic chemicals, as another health precaution. Dr. Walter Willett, head of the nutrition department at Harvard University, is a leading researcher on the effects of diet on health. In one 1990 study, he analyzed data from over 87,000 nurses in the Nurse’s Health Study, and concluded that eating meat significantly increased the chances of colon cancer in women. In another 1993 study,Willett and another researcher looked at data from over 50,000 male health workers, and correlated meat eating with higher risks of prostate cancer. Another major epidemiological study of vegetarianism was done at Loma Linda University in California. Epidemiology is the study of how diseases affect populations as a whole. Researchers analyzed data from over 25,000 people in the Seventh Day Adventist church, who are lacto-ovo vegetarians. These vegetarians had only 14% of the chance of dying from heart disease of other Americans. The Adventists also had significantly longer life expectancy. From this study, researchers estimated that eating meat just once a day triples the risk of dying from heart disease by age 64. It should be noted, however, that Seventh Day Adventists typically do not smoke or drink alcohol, and may have healthier lifestyles in general, affecting rates of heart disease. In another study in England that analyzed more than 10,000 vegetarians and meat eaters, researchers concluded there was a direct relationship between the amount of meat consumed and the chances of getting heart disease. Other studies have been performed on population data from World War II. In Norway during the war, the death rate from heart disease and strokes dropped significantly at the same time that the consumption of meat dropped. Other studies have concentrated on the benefits of eating fruits and vegetables. One researcher, Dr. Gladys Block, who was at one time an epidemiologist at the National Cancer Institute (NCI), grouped together over 200 studies up to 1991 that linked diet with cancer. She concluded that as people ate more fruits and vegetables, the risk of cancer decreased. Those who ate the most vegetables and fruits had half the risk for cancer as those who ate the least. Other studies have shown that diets high in fiber, which vegetarian diets tend to be, reduce the risk for heart disease, cancer, and other conditions including digestive disorders, appendicitis, and osteoporosis (bone loss). A lacto-ovo vegetarian diet, as prescribed by Dr. Dean Ornish, has been shown to improve heart disease and reverse the effects of atherosclerosis, or hardening of the arteries. Ornish’s diet was used in conjunction with exercise, stress reduction, and other holistic methods. Ornish allowed only the use of egg whites, which contain no fat, and nonfat dairy products in his low-fat vegetarian diet.